Looking to get back to your protozoan roots? The underwater world offers unparalleled adventures, but unlike with your single cell ancestors, it's going to take some training to get there. 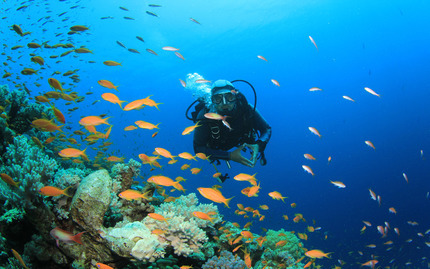 This open water course will teach you what you need to know to earn your Scuba certification. You'll learn the basic principles of diving, including safety and problem management, and partake in confined water dives to pick up the fundamental skills of diving. Then you'll take to the open water to further hone these skills and develop your confidence while exploring. This program will take place over multiple training sessions, and includes classroom time, indoor tank tie, and four lake dives. Note: Includes 8 Hours of 15' Heated Indoor Saltwater Training Poo; 8 Hours of Prescriptive Learning Classroom Academics, and 4 Training Dives in an Open Water Lake. You must be at least 10 years old and in reasonably good health. No prior Scuba Diving experience is required.